The self-portrait of Jacob H. speaks volumes about his attitude toward the diagnosis of peritoneal mesothelioma he received in 2010. 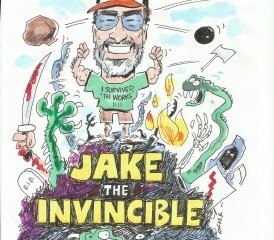 Jacob titled it “Jake the Invincible,” a caricature of him standing triumphantly atop the mesothelioma carnage that was expected to crush him, much like it has so many others. He refused to wave a white flag of surrender. Anything else would have been a surprise to those who know this strong-willed fitness buff who was playing rugby as recklessly as he ever did not long before his diagnosis. He stands proud and defiant in the portrait, rising above the rubble that includes a bloodied sword, a R.I.P. headstone, a skeleton arm and the serpents coming after him. His arms are raised in victory, a Baltimore Orioles baseball cap atop his head. Jacob, 60, is an inspirational survivor, a testament to the specially named “Quality of Life” treatment regimen promoted by surgical oncologist Richard Alexander, M.D., at the University’s Greenebaum Cancer Center. The six-hour surgery that removed his peritoneal lining, spleen and appendix, along with part of his liver and colon, may have knocked down Jacob temporarily, but it left him more determined than ever. “I told doc that while he was in there under the hood, he might also want to change the oil because I’ve got some miles left on these tires,” said Jacob, whose last name is being withheld over privacy concerns. Although Jacob jokes about his disease now, he understands how fortunate he is. He was younger, and considerably stronger physically, than most who are first diagnosed. That gives him quite an advantage in fighting off the cancer. Working in the medical profession, he also knew the routine. He knew the surgeons, oncologists, radiologists, and nurses who treated mesothelioma patients at the University of Maryland. He just never thought he would get to know them like this. Jacob, a biomedical imaging engineer for Siemens Corp., went from peer to patient with his diagnosis. It came from a doctor/friend, who almost started to cry when he delivered the news. He never spent much time thinking about where he was exposed to the asbestos that caused his mesothelioma. It could have been any number of places. He served in the Army from 1970-78 and lived in military housing that was loaded with asbestos. His father was a Navy man and worked among asbestos fibers for years, bringing it home on his clothes. Jacob then worked at General Electric for nearly 20 years. His work with medical equipment at Siemens included considerable time spent in older hospitals around the Baltimore/Washington area, ones filled with asbestos that was so prevalent in the 20th century. Instead of wondering where and how, Jacob focused on the future and what kind of treatment he wanted. He consulted with several doctors before settling on Alexander. Both before and after surgery, he ate healthier. He worked out more than he ever did. Less than three months after surgery, he returned to work, servicing imaging equipment at area hospitals. His rugby-playing days are over, so now he coaches it. He still works out regularly, cuts the grass at home and concedes little to the cancer that remains in his abdomen. His regular checkups with Alexander have gone from every three months to every six months. The last one was especially encouraging. Alexander often has his newly-diagnosed mesothelioma patients talk with Jacob, who happily offers his advice. Too often, though, Jacob will hear about a patient who gave up before even finding a doctor like Alexander who specialized in mesothelioma, a rare cancer with intricacies different from others. Jacob spent two weeks this month in Germany, sent there by Siemens for more training with the latest equipment he will be servicing. His routine has changed very little in recent months. He sees the same doctors, nurses and radiologists he saw as a patient. But he feels more like a peer once again. He is proud to be a mesothelioma survivor. Are you inspired by Jacob? Would you like to share your story of hope with us? Let us know in the comments below or on Facebook.